In Hogwarts we learn about the 4 House ghosts. The Fat Friar, Nearly-Headless Nick, the Bloody Baron, and the Grey Lady. Also, we’re introduced to Moaning Myrtle, Professor Binns, and Peeves (if you could count him) but there are supposed to be at least 20 ghosts at Hogwarts. He gasped. So did the people around him. About twenty ghosts had just streamed through the back wall. Pearly-white and slightly transparent, they glided across the room talking to each other and hardly glancing at the first-years. Harry Potter and the Sorcerer's Stone, Chapter 7, "The Sorting Hat"
Who are the other ghosts mentioned here? Does anyone know? Could the Headless Hunt be there as well? They weren’t named in the books - but JKR said she had more. The only ghosts actually named in the books are the four House ghosts, Moaning Myrtle, Professor Binns and Peeves (though he’s a poltergeist, not actually a ghost, and not considered as one by the Hogwarts ghosts either). However, JKR did have names for a few other ghosts who were never mentioned in the books or movies. In the books, though, none of those names are used - the other 14 (or 13 if counting Peeves the Poltergeist) are unnamed, similarly to how we don’t know the names of every student at Hogwarts, though we know there are more than the named ones. They seemed to be residents - they were arguing about Peeves. The about-twenty ghosts who were talking amongst themselves were talking about Peeves, and what they should do about him. This doesn’t seem like something the Headless Hunt, or other visiting ghosts, would be discussing. Since the ghosts all seem to be arguing about Peeves, a problem unique to Hogwarts that visitors likely wouldn’t care enough to be arguing over, it seems likely that the ghosts involved in that conversation were residents of Hogwarts. 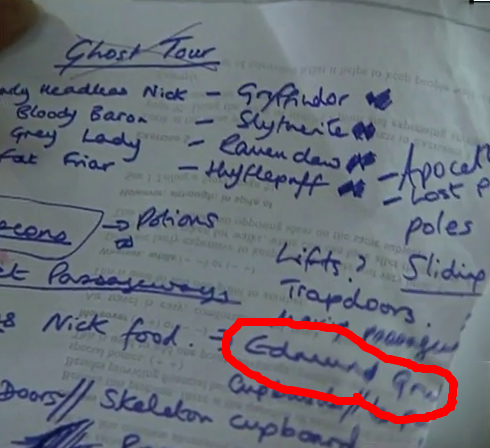 While they never appeared in the books, three more ghosts are mentioned in Rowling's drafts. The Toad - "left ectoplasm all over its classroom"
Edmund Grubb - "Expired in the doorway of the Dining Hall. Sometimes stops people getting in, out of spite. Fat Victorian ghost. (Ate poisonous berries)." How many ghosts haunt Hogwarts? What is the Bloody Baron's story? Why does Peeves listen to the Bloody Baron? How Did the House Ghosts End Up at Hogwarts? Are there other professors who were ghosts in the schools of witchcraft and wizardry? Why are the people in Hogsmeade scared of the Shrieking Shack? Could Peeves have gotten thrown out of Hogwarts? Why didn't Dumbledore ask ghosts to search for Chamber of Secrets? Why did Peeves think a ghost could become invisible?